I got an Anthropologie catalog in the mail yesterday. After looking through it I had the thought that it just seemed too good to go to waste in the recycle. So today I took it down the hall to my work room and made something out of it. I covered every other set of pages with gesso. This is one of those things where you need to be doing something else at the same time...paint gesso, walk away for 30 minutes, paint another page, walk away for 30 minutes. I got the laundry done and unloaded the dishwasher. Once dry, I sewed the pages together (with the non-gessoed pages back to back). Hummm...does that make sense? Basically I just want two pages together to make them sturdier. Here is my first set of gessoed pages. I sprayed the page with water, then added a thin coat of Aqua Dabber paint. Let it dry. So you're probably not suppose to put Distress Stain over paint since it's not porous but I'm going to anyway. Pumice stone is my color of choice. Just wipe it on while squeezing the bottle. I was drying the page with the Heat Tool and then I thought I might get a cool pattern if I used a brayer, so I did. Love it...that worked even better than I thought it would. After drying, I let it cure for an hour while I worked on some other stuff. One of which was drawing an oval shape on the computer and printing it out. I cut the oval out of the paper, then used it as a template to cut the oval out of plastic packaging material. I set aside the plastic for now...i'll come back to it though. I placed the paper oval on the page and used some Pumice Stone Distress Ink to color around the oval. I needed to add some detail to the center so this time I use the paper I cut the oval from (notice how I taped it back together at the bottom?). I stamped over the paper mask with Coffee Archival Ink to create an oval with great texture. The stamp is from the SA Mixed Media set. I know this next part might look kinda strange so hang in there with me. 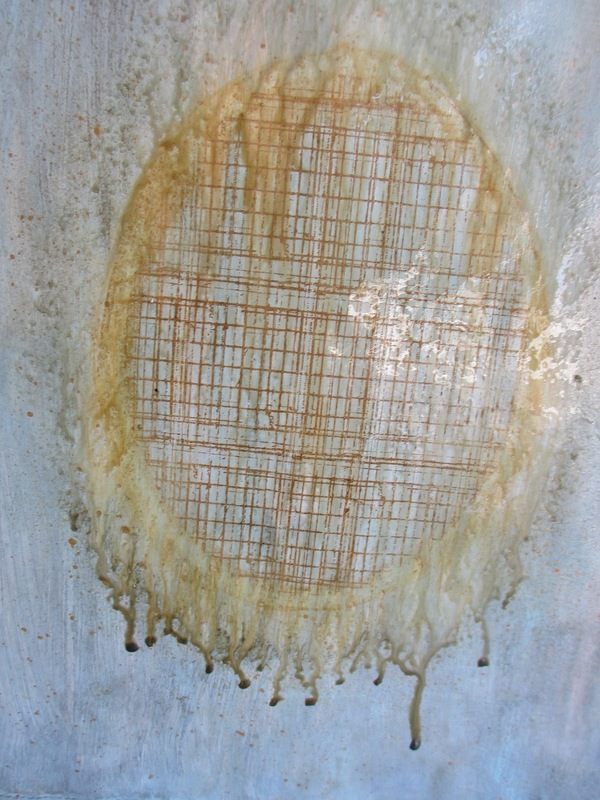 I squeezed out a bit of Tarnished brass Distress Stain onto my craft mat. 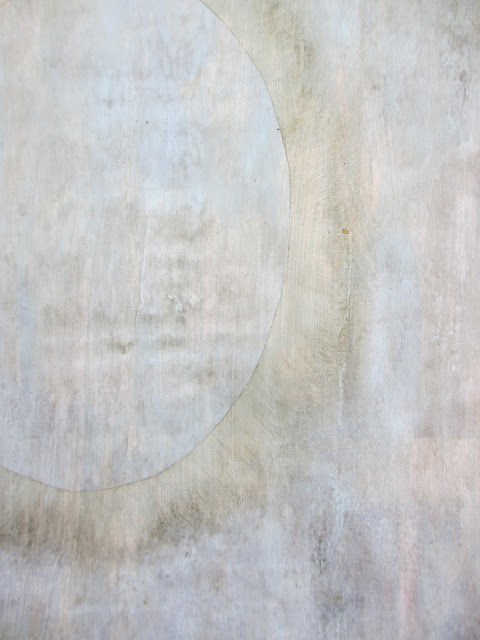 Then took a paintbrush and painted around the oval (I know, now I have made an ugly egg, lol). 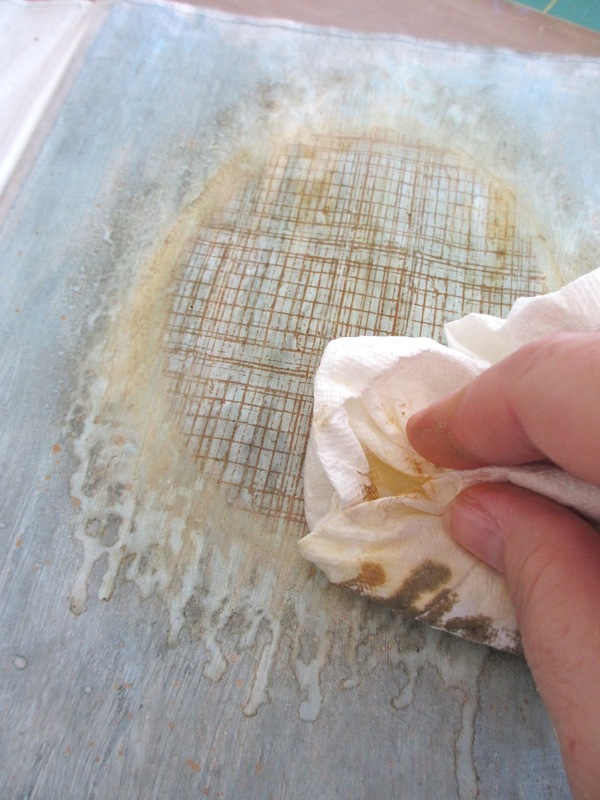 I added a bit more Tarnished Brass DS to the craft sheet, but this time I added a spritz of water to dilute the stain. Using the diluted stain and my paint brush I was able to create the small flicks of gold paint over the page. I sprayed the painted oval with a mini mister, then stood the book up so the paint would run. 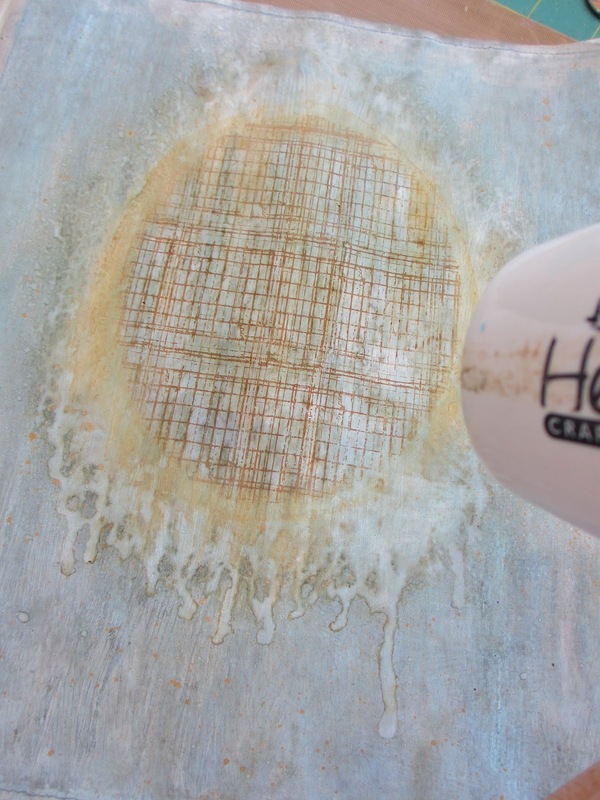 Distress Stain look might look dry but all you have to do is add water and comes to life again. Of course the pattern in the center is not effected because I stamped it with Archival which is waterproof. When I thought it was enough, I patted it with a paper towel to pull the color off the page. Oh, that looks good...take that crazy egg. So this is why I wanted an oval shape. 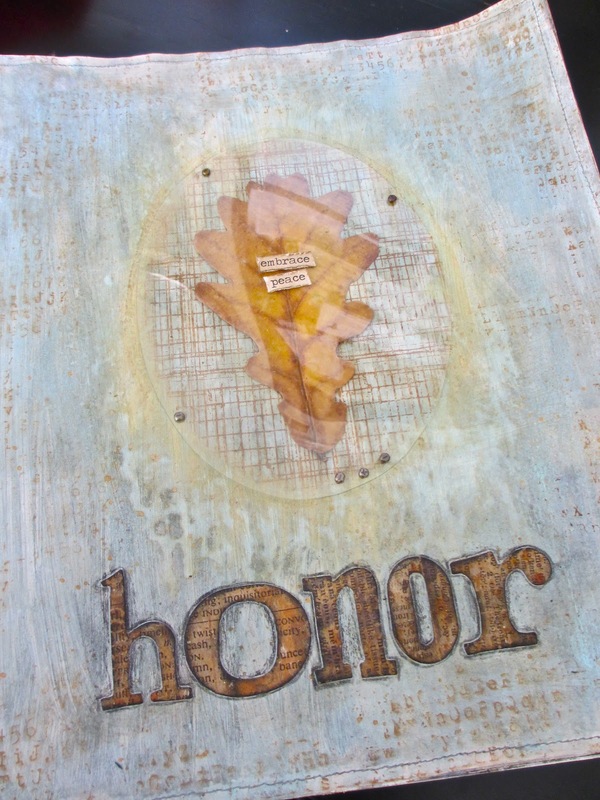 I thought it fitting that the page be about HONOR today since it is 9/11. This leaf reminds me of honor. 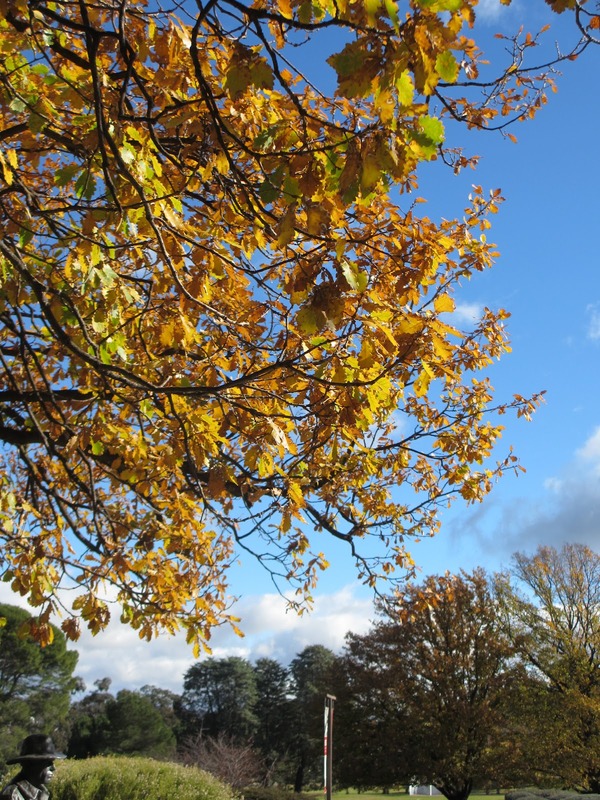 I picked up the leaf from under this beautiful tree when I visited the Australian War Memorial in June. Such peaceful grounds that surround the memorial... a feeling of reverence. Remember I cut the plastic oval? Here is where it comes in. 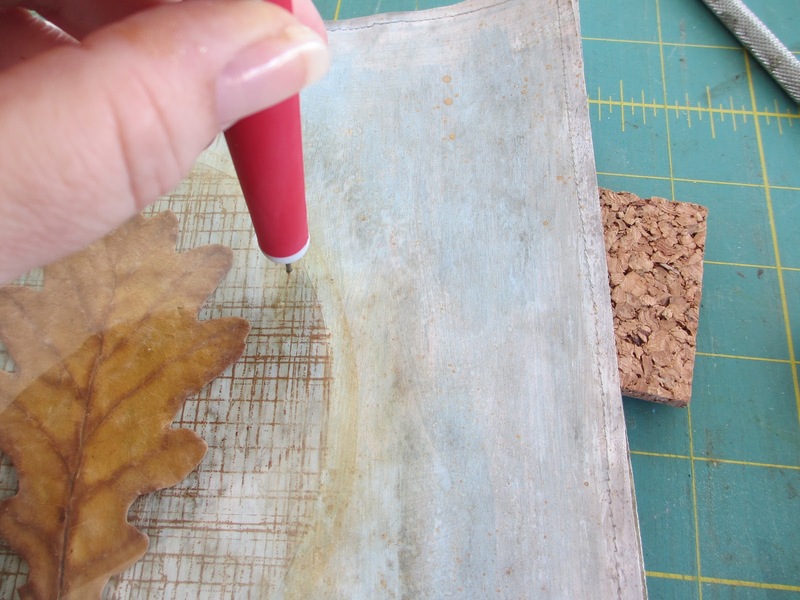 I decided to cover the leaf rather than glue it to try to preserve it longer. I used a craft pick and a piece of cork and just poked all the way through the plastic and the page. Super Easy. I used my favorite Mini Fasteners to secure the plastic. And no, I'm not worried that the tiny metal legs from the brads are on the other side of the page. It will give me a challenge to overcome when I get to that page. I like a challenges. Now I need the word, Honor. I used a page from Kraft Resist Paper Stash. I inked it with Distress Stain in Tarnished Brass, Rusty Hinge, and Dusty Concord....same method I used in my last post. I only needed a few letters so I cut pieces of the paper to fit over the letters on the Word Play die. Remember, when using an alphabet die you have to have the paper face down or the letters will be backward. Side Note: I also cut another piece of paper stash to cover the entire die. I figured I might as well cut an entire alpha for later since I am running the die through the machine anyway (Wordplay is a steel-rule die from Sizzix Alterations which means you can cut Grungeboard or chipboard with it). Once letters were cut, I inked the edges with Black Soot then adhered them to the page. A little black pencil gives a bit more detail. To finish up, I added the chitchat words, 'embrace peace' onto the plastic over the leaf. I also used Archival Ink in coffee (add the ink to the stamp with a quick swipe instead of a full inking up) to stamp a number/letters block - SA School Desk stamp set. Side Note: Before drying with a Heat Tool I used a blending tool to smudge the stamp image and blend it into the page a bit. Well, once again I can't seem to do a tutorial without 37 pictures. I am excited to see where this Anthropologie book takes me. I guess we shall see together. I LOVE it!!! your amazing!! I got the catalog too, thought this would be great to alter, and then threw it away! Darn! Now I wish I had kept it and played along with you... and the garbage is out at the curb for pickup... I don't think I'll go out in my jammies to find it - another catalog will come! Great inspiration -thank you! Beautiful tribute page, Paula. Can't wait to see what you do with the rest of the catalog. Paula .... recycling at its best. LOVE everything about this ... you and Deb are so talented. You are amazing. We love all the photos - a picture is worth a thousand words. Thanks again for all the inspiration. Ditto what Jmiselle posted - you are amazing, the photos are wonderful and thank you for all the inspiration. LOVE IT!!!!!! Your talent is amazing. You and Deb pull stuff out of your hats like crazy, you make up as you go (at least I think you do) and then take great pics to show us how you did it! Wow, I for one love all the pics and the detailed steps you ladies so generously put out, thank you so much! Imagine what Anthropologie folks would think of this being done to their catalog! I have a question: If you put gesso on alternate set of pages, how did you end up with gessoed pages next to each other in Pic4? I tried to think in terms of page 1, page 2 and tried to figure out but it's not clear yet...hope you will answer my question. Othewise I will figure it out :) Thanks again! 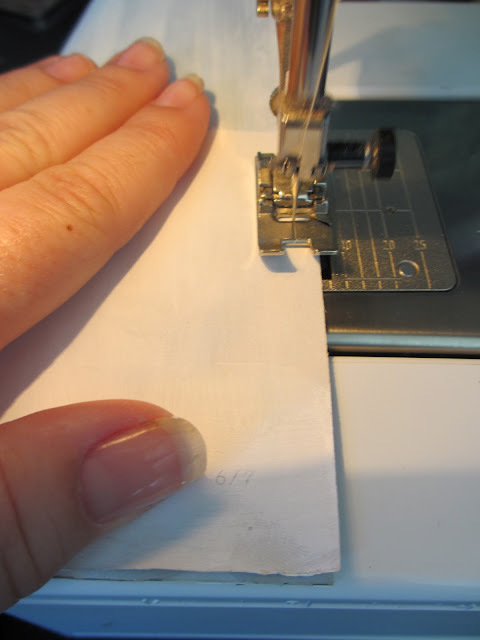 rkramadh - the easiest way to figure out what pages to Gesso is to paperclip the pages you will eventually sew together FIRST. Once you have worked your way through the catalog you can go back and either start sewing or Gesso-ing...it really doesn't matter which comes first. Thank you so much for taking the time to reply to my query! I am off to subscribe to the catalog. I think they will see a deluge of catalog requests after so many of us have seen what you do with them. They probably think sales will be going way up LOL. I have never had a catalog from Anthropologie but I am going to figure out how to get one. super easy, just go online, scroll to the bottom. Click on catalog and then receive by mail. Done. Wow...what an amazing page! I absolutely love it...and all the pictures! Thanks for sharing the idea with all of us!! thanks for the article Joy. Of course I brought home more than one so I can try it on some of the others! I love how you mounted the leaf and only used randomly place brads. Lol! I got the same catalog and thought I might use a few of those photos in an art journal, but I would never have thought to use it as a journal, much less sew the pages together!!! You rock!!! Brilliance meets recycling! Great recycling! Lovely tribute.....inspiration right through the photos - which are good to have by the way! Love it and so creative. I love all the photos - I'm more of a visual person so you can't have too many. Awesome page, and what wonderful recycling! Beautiful page and here I thought all magazines HAD to be recycled!! Who would've thought...thanks for sharing, Paula. I love the idea and the reason behind it too! Thanks so much for sharing! You are so creative. You really knew what you were doing and have the knowledge of the effects of certain materials when used. This is being resourceful and making use of time to be productive. Thanks for sharing your passion for art. Why have I just discovered your blog???!! It is complete wonderfulness, with soo many inspiring ideas and creations. I absolutely LOVE 7gypsies products!! Love how you have totally changed this piece, Pula. I look foward to seeing more.